What’s With Everybody Comparing Athletes in Other Sports to Mariano Rivera? Jets Draft Preview: What Do You Get for the Team That Has Everything? The Jets were one game — really, one half away — from the Super Bowl last year, and they have constructed their roster accordingly; they are acting like a team that already has the primary pieces in place and just needs to tweak here or there. On one hand, this makes sense — the pieces do seem to be there. On the other, the Jets were incredibly fortunate to make the playoffs in the first place, and if they hadn't been facing teams with little interest in winning the final two weeks of the season, well, let's just say we don't think you'd be watching these guys mug it up on Hard Knocks in training camp. The Jets go into the draft Thursday acting like champions that, well, they're just not — not yet. Thus, the Jets are treating the draft as more an opportunity to add to the coffers than fill a gaping need. They would seem to have a hole at safety, and there are certainly some options out there, but they're also eyeing a pass rusher. The trade for Santonio Holmes eliminated the need to take a wide receiver in the first or second round, though it might not hurt to have one hanging around for the first four games of the season, considering Holmes is suspended for those. So, who does everybody think they're taking? Todd McShay of ESPN likes Jared Odrick, a defensive tackle from Penn State, who is not exactly a pass rusher but would certainly be a safe pick. 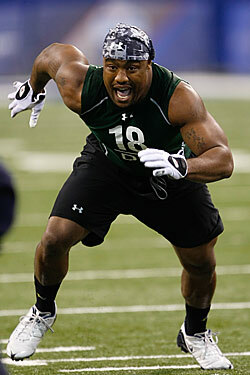 Don Banks at SI likes the pass rushing (but potential off-field headache) Everson Griffen of USC. Pete Prisco at CBS likes Griffen, as well. But it's looking like defense, the Jets' strength last season. The Jets are going for the whole thing next year; more defense never hurt anybody.